SEATTLE – The Seattle Storm today announced that Storm co-owner Ginny Gilder has joined the ‘Pedal for Pat’ initiative, a 1,098 mile bike ride to raise money for The Pat Summitt Foundation. ‘Pedal for Pat’ will span Oct. 17-28, 2017, beginning at the Pat Summitt statue in Knoxville, TN, and concluding in Key West, Fla., The route was chosen so cyclists will ride one mile for each of Summitt’s wins as the University of Tennessee women’s basketball head coach. Storm fans have the opportunity to support Gilder and the ‘Pedal for Pat’ cycle event through financial donations. She’s set a personal goal of $15,000, with the first $10,000 set to be matched by an anonymous donor. Those interested in donating will have the opportunity to take advantage of Seattle Storm tickets, merchandise and autographed items. In accordance with Pat Summitt’s wins, suggested donations start at $10.98, and can be made directly to Gilder. Gilder is the managing member of Force 10 Enterprises, which owns Force 10 Hoops, the WNBA’s Seattle Storm franchise, Force 10 Sports Management, which provides marketing and management expertise to local and national sports organizations, and Force 10 Performance, an affordable multi-sport training center for all athletes and abilities. This latest career chapter blends her love of business with her passion for sports and deep belief in its power to transform lives. Force 10 Enterprises is dedicated to the philosophy that women should enjoy access to competitive opportunities at every level: the Storm showcases the power of women as inspirational athletes and leaders and Force 10 Performance makes affordable, world class training available to everyone. In addition, Gilder has started several entrepreneurial ventures, both businesses and non-profits, whose founding dreams range from the practical to the transformational. She is CEO of the Gilder family investment office (which she founded in 2004) and president of one of her family’s philanthropic entities, the Starfish Group, whose mission is to champion the underdog, individuals who face steeper odds in creating a sustainable life for themselves. A rower, she earned four varsity letters at Yale University, and was an All-Ivy Champion three times. Her freshman year, she helped usher in the post-Title IX era at Yale by participating in the now-famous women’s crew strip-in protesting the lack of equal facilities. Gilder represented the United States on four national teams, including two Olympic teams. She was named to the U.S. team which boycotted the 1980 Moscow Olympic Games and won a silver medal as the stroke of the women’s quadruples sculls with coxswain at the Los Angeles Olympic Games in 1984. She holds a pair of international medals, including a bronze from the 1983 World Championships in the single. The author of the memoir, Course Correction: A Story of Rowing and Resilience in the Wake of Title IX, Gilder helped launch community rowing programs in Boston, MA and Derby, CT. She received an NCAA Silver Anniversary Award for community service in 2004 and was the recipient of the 2015 US Rowing Association Jack Kelly Award and the 2015 Yale University George H.W. Bush ’48 Lifetime of Leadership Award. Crisp and a core group of riders announced Pedal for Pat in March 2017 and have been training ever since. Each team member is committed to raising $10,000 which will be donated to The Pat Summit Foundation, which designates 100 percent of its grant funding to The Pat Summitt Clinic. Pedal for Pat is a cross-country cycling fundraiser in which a team of 12 individuals will ride for 12 days from Knoxville, Tennessee, to Key West, Fla. Each team member will raise a minimum of $10,000 benefitting The Pat Summitt Foundation, which designates 100 percent of its grant funding to The Pat Summitt Clinic at The University of Tennessee Medical Center. The team will ride a total of 1,098 miles to commemorate Pat Summitt’s 1,098 wins as the legendary coach of the University of Tennessee Lady Volunteer basketball team. Joshua Crisp, president and founder of TLC Senior Living and partner at Knoxville-based Dominion Senior Living, a faith-based company which owns and operates assisted living and memory care communities throughout Tennessee, Kentucky, and South Carolina created the event to honor Summitt and raise awareness about Alzheimer’s disease and other forms of dementia. He will be co-chaired on the ride by Michelle Brooke-Marciniak who starred at the University of Tennessee under Summitt from 1993-96, and helped to carve out 91 of Summitt’s 1,098 victories. As an Academic All-American and a fiery leader on the court, Michelle drove Tennessee to the 1995 and 1996 NCAA title games, as well as captained the National Championship team in 1996, and was named the NCAA Tournament Most Valuable Player. In 2012, Tennessee honored her extraordinary basketball career and contributions to UT women’s athletics by inducting her into the Lady Vol Hall of Fame. She is now the Co-Founder of SHEEX®, Inc., the world’s first performance fabric bedding company with globally patented technology and also serves on The Pat Summitt Foundation Advisory Board. The Pat Summitt Foundation, a fund of East Tennessee Foundation, was established by Pat and Tyler Summitt in November 2011. Its mission is to award grants to non-profit organizations that advance research for treatment and a cure, provide support for patients and caregivers, and educate the public on Alzheimer’s disease. In 2015, The Pat Summitt Foundation formed a strategic partnership with The University of Tennessee Medical Center to create The Pat Summitt Clinic. The clinic, which opened in December 2016, greatly improves access to healthcare services for families and patients facing Alzheimer’s disease in a facility created to advance Alzheimer’s research, detection, treatment, family caregiver support, and ultimately, lead to a cure. To learn more please visit www.patsummitt.org, like us on facebook.com/patsummittfoundation, and follow us on Twitter and Instagram @webackpat. 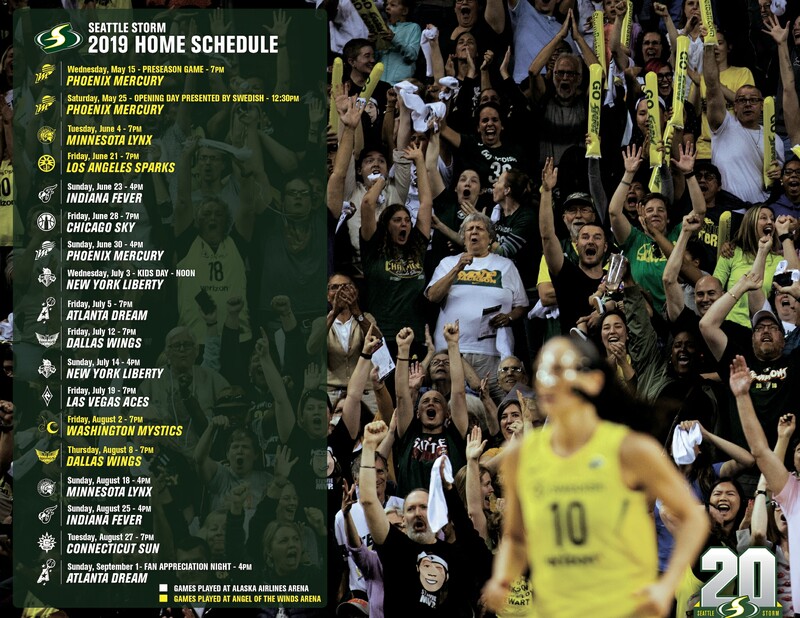 The Seattle Storm is a two-time WNBA championship team committed to bringing a premium professional basketball and entertainment experience to a fan base rich in tradition and support. The organization places high value on community and building platforms to positively impact the overall entertainment, attraction and economy of the Puget Sound region. In addition, the Storm is dedicated to local youth development in the areas of fitness and wellness; with a special emphasis on inspiring leadership, motivation and the empowerment of girls and women. For more information or to purchase tickets, please visit StormBasketball.com.